By Wor. Albin K. Parker. Seventy-five years ago, what is now the prosperous town of Norwood was but the village of Dedham, known as the Second Parish, or South Dedham, with farms and some manufactures, including tanneries and printer's ink. Two of these concerns are among the largest of their kind today in the United States. The whole expenditure of the town of Dedham, which included Dedham, Westwood, and Norwood in the year 1860, which had just past when Orient Lodge was instituted, was but $25,810.25. We were a small community with a few Masons whose membership was scattered over different Lodges. Some were probably made Masons in Old Constellation Lodge, of Dedham, which was chartered on March 12, 1802, and which had long since surrendered its charter. Others were affiliated with Boston Lodges. South Dedham, February 4, 1861. "The following gentlemen met in the small hall over Village Hall as above for the purpose of making arrangements for organizing a Lodge of Free and Accepted Masons, viz. : Joseph Day, Josiah W. Talbot, T. P. Jordan, C. E. Davidson, E. M. Gay, J. S. Woodman, commencing at seven and one-half o'clock by choice of J. W. Talbot as Chairman and T. P. Jordan as Secretary. On motion voted to establish a Lodge of Ancient, Free and Accepted Master Masons if a dispensation could be had from the Grand Lodge of Massachusetts and the following brethren were then selected as officers of the Lodge: Bros. J. W. Talbot, Wor. Master; Thos. P. Jordan, Senior Warden; Elijah Wheelock, Jr., Junior Warden. They voted that a committee of three be appointed by the Chair to make all the necessary arrangements for starting a Lodge of Masons with full power to act in premises. Said committee consisted of the following brethren: Wor. Master, J. W. Talbot, Senior Warden, T. P. Jordan, and C. E. Davidson. Voted to adjourn and call a committee." Signed: T. P. Jordan, Secretary. Evidently the committee got to work at once, for we find that on February 25, 1861, the Grand Lodge had granted a dispensation to the Lodge to work and at that meeting there were eight applications for the degrees and the fee was set at $20.00. Among those applications was one from John E. Smith and one from Lewis Day. Mr. John E. Smith was a member of the firm of Lyman, Smith and Company which concern affiliated with Winslow Bros. & Smith and formed the present large leather concern of Winslow Bros. & Smith Company of which our honored Brother Frank G. Allen, former Governor of Massachusetts, is Chairman of the Board of Directors. Mr. Lewis Day was also in the leather business and built the house on Day Street now owned and operated by the Norwood Historical Society. Mr. Day was one of the wealthiest men in South Dedham and later represented this district in the State Legislature. At this second meeting also it was voted to make arrangements with the Norfolk Division Sons of Temperance to occupy the large hall over Village Hall together, sharing expenses. The record does not say whether the Sons of Temperance had any influence over our Masonic Brethren. The Lodge must have selected good committees on the applications, for at the meeting held on March 4, 1861, just one month after the first meeting and on the day of the inauguration of President Lincoln, we find that one candidate whose name was proposed on February 25 was rejected, three candidates initiated, and two more candidates proposed. Two days later, March 6, 1861, one of the candidates proposed at the March 4th meeting was elected and two of those elected on February 25th were initiated. The next day, March 7, more candidates were initiated. At the February 25th meeting the first officers were appointed: Secretary, Henry C. Morse; Treasurer, Joseph Day; Senior Deacon, Eben M. Gay; Junior Deacon, C. E. Davidson; Steward, J. S. Woodman; Tyler, Joseph Sumner. Thus commenced Orient Lodge which for these seventy-five years has prospered, and although there have been times in its history when the prospects were anything but bright and when courage and good business management have been needed, in the present days of depression we need only to look back to a period in the 70's when for five years there was an average of only two candidates raised each year and during which period a readjustment was made in the quarters of the Lodge. On March 18, 1862, the Masonic Hall was dedicated and consecrated by the Grand Master and Orient Lodge was recognized by the Grand Lodge as a subordinate Lodge, having full power to work and transact such business as shall regularly come before it. Although the records do not state the fact, it is probable that Orient Lodge received its charter on this day with its date to commence on February 22, 1861. The Lodge met for many years in the Village Hall property which stood on Washington Street at the corner of Cottage Street where the Folan Block now stands, and the meetings were held in a little hall over the auditorium of this building. On December 24, 1866, a committee of five members was appointed to investigate in regard to purchasing the property known as the "Straw shop." On December 31, 1866, it was voted not to purchase, but that the same committee be retained to see if land could be procured suitable for a Masonic building. Apparently this committee did not report and on December 9, 1867, a committee of three was appointed to investigate the advisability of purchasing the Village Hall property or to appeal to the owners of the building to remodel Masonic Hall. We find that the committee reported on January 6, 1868, that most of the stockholders of the property were willing to sell the building for seventy-five cents on a dollar of its original cost. The record says that the condition of the property of the Lodge and inadequate accommodations prompted the committee to recommend an increase of accommodations and there did not seem to be a more suitable building than the building now occupied by the Lodge. There was much discussion regarding this proposal, and no definite action taken at this meeting but the committee was retained for further investigation of the matter. On April 6, 1868, we again find the matter of the purchase of this property brought before the Lodge, and it was reported that the property, real and personal, could be bought of the stockholders for $7,011.13, including land recently acquired and the improvements thereon, and that two trustees be appointed by the Lodge to hold and receive the property for the benefit of the Lodge should they desire to purchase same. This committee's report was accepted; on May 4, 1868, it was voted to make the purchase and choose a board of two trustees to hold the property. On May 20, 1872, the question of enlarging the Village Hall property came before the Lodge and it was voted not to proceed. Evidently the Lodge did not improve its accommodations at once for a report submitted by the Master of the Lodge, Wor. J. A. Rhoads, on January 18, 1876, stated that the Lodge-room was the worst in the whole jurisdiction and,recommended that better arrangements be made by the trustees as soon as the finances of the Lodge would warrant. At the August 28th meeting in 1876 a committee reported and it was voted to build an addition for a cost not to exceed $4,900, provided that the store part of the building be rented for the term of five years and that money could be borrowed at the rate of 7' ,. It would seem that the committee did not fully carry out the original order of the Lodge for a report of their work shows that they spent $9,167.46 on the addition and paid 7⅜% on the money borrowed. This addition, however, provided the quarters of Orient Lodge until 1915, when the building was sold to Mr. George F. Willett, who moved it to its present site on Broadway, where it is now occupied by Ambrose Press, publishers of the Norwood Messenger, the Boston Piano Supply Company, and the Codex Book Company. Many of our members first saw light of Masonry in this building, and the memories of the work done and friendships formed under its roof are a sacred heritage. As the town of Norwood increased and prospered, the Masonic Hall property became more valuable and an offer which could not be declined was made for the property and Village Hall was sold. From October, 1915, to September, 1917, the Lodge met in Conger Hall at the corner of Railroad Avenue and Washington Street until it was moved into our present quarters on Day Street. While there had been much controversy over the affair of the Old Village Hall property in 1877, there was apparently none when the committee was appointed on the Day Street property, tor from the time this project was commenced until the building was dedicated not a single vote was cast against the committee's recommendations and the whole transaction was unanimous and harmonious. The Lodge was fortunate in having for an architect one of our own members, Bro. William G. Upham, and for the Chairman of its committee, Bro. Frank A. Fales. The other members of this committee were: Brothers Walter F. Tilton, Charles A. (iilmore, Frank A. Morrill, Frederick L. Fisher, Henry F. Walker, Worshipful Francis E. Everett, L. N. Newman, Worshipful Ezra L. Hubbard, Worshipful Martin J. Blasenak, Right Worshipful Andrew C. Morrow. Our present home is now free of debt and we occupy as beautiful a temple as will be found in any town of our size in the state. For many years the town of Walpole and also Medfield were within the jurisdiction of Orient Lodge. In 1921, Azure Lodge, of Walpole, was instituted and this took from Orient Lodge a number of our Walpole Brethren. Azure Lodge was formed with perfect harmony from Orient Lodge, and we look upon Azure Lodge as a fond offspring and rejoice in its activities and growth, wishing it the greatest prosperity in the years to come. It was with much regret that we learned of the loss by fire of their quarters in Walpole two years ago and we were glad that we were able to have them use our Temple until their new quarters were completed. As we look back we find many Brethren who have made the splendid history of Orient Lodge possible. As in all institutions there are outstanding members, so Orient Lodge has its own. Perhaps the outstanding man in the formation of the Lodge was Bro. Joseph Day, who held the position of Treasurer from the beginning of the Lodge in 1861 until his death in 1876; a man who did not perhaps come into the limelight as much as some others but who, with his advice and counsel was a strong man in the affairs of the Lodge. Brother George L. Rhoads was for three years a District Deputy Grand Master and served on many committees and was influential in the work of the Lodge in the early days. Two men, entered, passed, and raised at the same time, were vital factors in the growth of Masonry in Norwood, viz. : Right Worshipful Sumner Bagley and George H. Morse. It was said of Right Worshipful Brother Bagley that he could fill any office in the Lodge, Chapter, Council, or Commandery at an instant's notice and properly quote the ritual. He was nearly always present at the meetings and could prompt officers at any time. Brother Bagley rendered efficient work as an instructor and his candidates were always ready to pass an examination in open Lodge. One of his candidates recently said that his only failure in his examination was that he gave the plural of a word when it should have been singular and that Brother Bagley reminded him of it afterwards. No man was ever more interested in the work or had a better knowledge of Masonry, and it is gratifying to know that his son, Right Worshipful Walter S. Bagley, has followed his example and is highly esteemed in the Lodge today and that his grandson, Louis Bagley, has just recently started in office and it is expected that he also will fulfill the prestige given by his grandfather in the work of Orient Lodge. Bro. George H. Morse, who received the degrees with Right Worshipful Brother Bagley, left to Orient Lodge at his death a donation which has helped a great deal in the upkeep of our present Temple. Since 1867, there have been but three Tylers in Orient Lodge, viz. : Warren E. Rhoads, Walter D. Chickering, and Arthur L. Bateman—Brother Rhoads serving from 1867 until his death in 1912, a period of forty-five years; Walter D. Chickering serving from 1913 to 1923, a period of ten years; and the present Tyler, Arthur L. Bateman serving since that date. Much could be said about Warren K. Rhoads. He was the Chief of Police of the town for many years and aside from his duty as Tyler, he also furnished the supplies when the Lodge was called from labor to refreshment. Many of our members know how we looked forward to the end of the evening and wondered what Warren would have waiting for us. We were sure of one thing — it would be good. It is not often that a Tyler in these days has to exercise his dutv in keeping off cowans and eavesdroppers, but that is one thing that Tyler Chickering certainly did once in the Old Village Hall Building. There was a commotion one meeting night just outside one of the windows and on examination Tyler Chickering found a young man hanging to the eavestrough looking into the lobby. The young man apparently wanted to see how it was done inside without going through the regular formalities, but Brother Chickering thought differently for he reached through the window, pulled the young man in, and he was sent down the stairway with a rather uncomfortable feeling, well, just where one might think he would have it. What can be said of the third man, Arthur L. Bateman? Certainly this historian cannot say enough. Not only has he filled his Tyler's position faithfully, but for twelve years he has personally given the lectures to all applicants and never in all this time has a candidate appeared in Orient Lodge to be examined without a mark of at least 98%. Brother Bateman is a man who never has sought a high office in the Lodge, but whose whole heart and soul are bound up in the work and one who doesn't let his left hand know what his right hand doeth. Upon the death of Right Worshipful James A. Hartshorn, the Lodge lost a true friend to Masonry. He was invariably asked to install the officers of the Lodge and did it in a manner not only ritually correct, but which left an impression with the elected officers of the high quality of the work which they were to perform. Until his death, Worshipful Francis E. Everett acted as his installing marshal. They were competitors in business and formed a friendship and companionship such as only an organization like ours could bring about. Recognition should be given to a Chaplain of the Lodge for a great many years, Rev. George Hill, who was always ready to help in any way and who was not only a good pastor and a good Chaplain, but who also had good business acumen and in the former days served on many committees. Perhaps one of the finest experiences during the period of the writer's term as Master was when the degrees were given to our brother, Hon. Frank G. Allen, who was then President of the Massachusetts State Senate and afterward our Governor. Perhaps the largest attended meeting ever held in Orient Lodge was when he received his third degree and was raised by Judge John M. Gibbs. Brother Allen has shown his appreciation of Masonry and of Orient Lodge in his quiet way of doing things and we are honored with his membership. The quiet man who accomplished much was late Brother Frank A. Fales, who was largely influential in the building of our present Temple, not only in his sound business ability but in obtaining land on which to build and construct the building so that we received the most for our money. Mr. Fales didn't say much but he did a lot. We hold in reverence the memory of Andrew C. Morrow, Past Master, Past District Deputy Grand Master, Past High Priest, Past Grand Scribe, Past Thrice Illustrious Master, Past Commander, a lovable man not only in the confines of Orient Lodge but throughout the whole jurisdiction. The type of men that I have mentioned above is the foundation upon which our Orient Lodge has builded and which will be the incentive to a larger growth in the years to come. Orient Lodge has done much in the way of its relief. There is a record in May, 1867, in which a Lodge in Winchester, Virginia, asked for aid because its quarters had been destroyed in the War of the Rebellion and while feeling ran high between the North and South the barriers were removed when it came to Masonry, for Orient Lodge did its share to help out the stricken Lodge in the South. Again the records show one of our members, Mr. Samuel S. Morrill, who was stricken on a train in Richmond, Virginia, in 1873 and died, and the Lodge in that city did everything that could be done and the correspondence between the two Lodges certainly shows that barriers between North and South were eliminated even in those early days just after the War. There is now living in another part of the State a little old lady whom Orient Lodge has seen fit through the help of the Grand Lodge to care for. She is now ninety years of age and for fifteen years has been able to be happy because her husband first saw the light of Masonry many years ago. There have been a number of visits to Orient Lodge in these seventy-five years by Grand Masters and their suites and it is with pleasure that we tonight greet our genial Grand Master, Most Worshipful Claude L. Allen. The laying of the cornerstone of our present Temple was done by that great friend of all Masons in the Massachusetts jurisdiction, Most Worshipful Frederick W. Hamilton, our Grand Secretary, who recently related his experiences on that day. Called upon at the last minute because of unforeseen circumstances, he performed this ceremony in a wonderful and impressive manner. The Bible which lies upon our altar was the gift of that splendid man, Most Worshipful Leon M. Abbott, at a visit of the Lodge with his suite. The Speculative Masonry which we practice today teaches great principles, the highest ideas of character, and the practices of integrity. These were the factors in the lives of our founders. They are the foundations upon which we in the future must build and if Masonry is to continue to grow strong in the future, as it will, we must all not only here in Orient Lodge, but everywhere, carry out in our daily activities the great lessons we are taught within these walls. There never was a time in the history of our country when men of moral upright character were more needed than right now, in all affairs of life, and we, as Master Masons, should, every one, practice what we know to be the true moral virtues that our growth may be strong and secure. By Bro. Herbert W. Barrett Bro. Edwin C. Archibald. One hundred years .ago, what is now the prosperous Town of Norwood was a village in Dedham known as the Second Parish, or South Dedham, with farms, tanneries, and some manufacturing, including printers' ink. Two of these concerns were among the largest of their kind in the United States. In the year 1860, before the institution of Orient Lodge, the total expenditure of the Town of Dedham, which included Norwood and Westwood, was only $25,810.25. Looking backward for one hundred years brings us to a time at which our country was making history very fast. On February 4, 1861, seven Master Masons gathered in the little hall over Village Hall in South Dedham to talk over the advisability of forming a Lodge of Free and Accepted Masons. We were a small community with a few Masons whose membership was scattered over different Lodges. Some were probably made Masons in old Constellation Lodge of Dedham, which was chartered on March 12, 1802, and had long since surrendered its charter. Others were affiliated with Boston Lodges. It was just one month previous to the first inauguration of President Abraham Lincoln and only two months previous to the firing on Fort Sumter, and it would seem that these seven men must have had a great deal of courage and a firm belief in the teachings of the Fraternity to have undertaken the responsibility of organizing a Lodge. Evidently the committee got to work at once, for we find that on February 25, 1861, the Grand Lodge had granted a dispensation to the Lodge to work and at that meeting there were eight applications for the degrees and the fee was set at $20.00. Two of the applications were from John E. Smith and Lewis Day. John E. Smith was a member of the firm of Lyman Smith & Company, which affiliated with Winslow Bros. & Smith and formed the large leather concern of Winslow Bros. & Smith Company. Bro. Lewis Day was also in the leather business and built the house on Day Street now owned and operated by the Norwood Historical Society. Mr. Day was one of the wealthiest men in South Dedham and later represented this district in the State Legislature. At the February 25th meeting the first officers were appointed: Secretary, Henry C. Morse; Treasurer, Joseph Day; Senior Deacon, Eben M. Gay; Junior Deacon, C. E. Davidson; Steward, J. S. Woodman; Tyler, Joseph Sumner. Thus was the start of Orient Lodge, which has continued for one hundred years through periods in its history when prospects were anything but bright and courage and good business management were needed. At this second meeting it was voted to make arrangements with the Norfolk Division of Temperance to share expenses for use of the large hall in Village Hall. The Lodge must have selected good committees on the applications for at the meeting held on March 4, 1861, just one month after the first meeting, and on the day of the inauguration of President Lincoln, we find that one candidate, whose name was proposed on February 25, was rejected, three candidates initiated, and two more candidates proposed. Two days later, March 6, 1861, one of the candidates proposed at the March 4th meeting was elected and two of those elected on February 25th were initiated. The next day, March 7th, more candidates were initiated. On March 18, 1862, the Masonic Hall was dedicated and Orient Lodge recognized by the Grand Lodge as a subordinate Lodge having full power to work and transact such business as should regularly come before it. Although the records do not state the fact, it is probable that on this day Orient Lodge received its charter, issued as of February 22, 1861. The Lodge met for many years in the Village Hall property which stood on Washington Street, at the corner of Cottage Street, where the Folan Block now stands, and the meetings were held in a little hall over the auditorium of this building. On December 24, 1866, a committee of five members was appointed to investigate in regard to purchasing the property known as the "Straw Shop." On December 31, 1866, it was voted not to purchase, but that the same committee be retained to see if land could be procured suitable for a Masonic building. Apparently this committee did not report and on December 9, 1867, a committee of three was appointed to investigate the advisability of purchasing the Village Hall property or to appeal to the owners of the building to remodel Masonic Hall. We find that the committee reported on January 6, 1868, that most of the stockholders of the property were willing to sell the building for seventy-five cents on a dollar of its original cost. The record says that the condition of the property of the Lodge and inadequate accommodations prompted the committee to recommend an increase of accommodations and there did not seem to be a more suitable building than the building now occupied by the Lodge. There was much discussion regarding this proposal, and no definite action taken at this meeting, but the committee was retained for further investigation of the matter. On April 6, 1868, we again find the matter of the purchase of this property brought before the Lodge, and it was reported that the property, real and personal, could be bought of the stockholders for $7,011.13, including land recently acquired and the improvements thereon, and that two trustees be appointed by the Lodge to hold and receive the property for the benefit of the Lodge should they desire to purchase same. This committee's report was accepted; on May 4, 1868, it was voted to make the purchase and choose a board of two trustees to hold the property. On May 20, 1872, the question of enlarging the Village Hall property came before the Lodge and it was voted not to proceed. Evidently the Lodge did not improve its accommodations at once for a report submitted by the Master of the Lodge, Wor. J. A. Rhoads, on January 18, 1876, stated that the lodge-room was the worst in the whole jurisdiction and recommended that better arrangements be made by the trustees as soon as the finances of the Lodge would warrant. Up to about 1912, the dues were three dollars a year. At the August 28th meeting in 1876 a committee reported and it was voted to build an addition for a cost not to exceed $4,900, provided that the store part of the building be rented for the term of five years and that money could be borrowed at the rate of 7%. It would seem that the committee did not fully carry out the original order of the Lodge for a report of their work shows that they spent $9,167.46 on the addition and paid 7-/$% on the money borrowed. This addition, however, provided the quarters of Orient Lodge until 1915. Many of our members first saw the light of Masonry in this building, and memories of the work done and friendships formed under its roof are a sacred heritage. As the Town of Norwood grew and prospered, the Village Hall property became more valuable. An offer was made for it which the members of Orient Lodge felt ought not to be declined. As a result, George F. Willett purchased the property for $27,500, plus an additional amount of $35.75 for the old fixtures and stove. He then moved the building to its present location on Broadway. From October 1915 to September 1917 the Lodge met in Conger Hall at the corner of Railroad Avenue and Washington Street. Temporary rented quarters proved unsatisfactory and inadequate and a committee was appointed, headed by Bro. Frank A. Fales, which arranged for the purchase of the property on Day Street. The Lodge was fortunate in having among its members an architect, Bro. William G. Upham, who designed the present beautiful temple. The design of this temple has been used as a basis for the construction of many similar buildings since erected. The cornerstone was laid Aug. 12, 1916, at a ceremony participated in by officers and members of the Deputy Grand Lodge, and documents and objects of historic and Masonic interest were placed in a box under the corner-stone. Bro. Ralph E. Bullard was the orator for the occasion. The Temple was dedicated at a meeting of the Grand Lodge held on the evening of September 27, 1917, and presided over by M. W. Grand Master Leon M. Abbott. An address was delivered by R.W. James A. Hartshorn, who had previously served as Master for three successive terms and always maintained an active interest in the Lodge. Orient Lodge has done much in the way of relief. There is a record in May 1867 in which a Lodge in Winchester, Virginia, asked for aid because its quarters had been destroyed in the War of the Rebellion; and while feeling ran high between the North and South, the barriers were removed when it came to Masonry, for Orient Lodge did its share to help out the stricken Lodge in the South. Again the records show one of the members, Bro. Samuel S. Morrill, who was stricken on a train in Richmond, Virginia, in 1873 and died, and the Lodge in that City did everything that could be done and the correspondence between the two Lodges certainly shows that harriers between North and South were eliminated even in those early days just after the Civil War. As we look back, we find many Brethren who have made the splendid history of Orient Lodge possible. As in all institutions, there are outstanding members, so Orient Lodge has its own. Perhaps the outstanding man in the formation of the Lodge was Bro. Joseph Day, who held the position of Treasurer from the beginning of the Lodge in 1861 until his death in 1876. A man who perhaps did not come into the limelight as much as some others but who, with his advice and counsel was a strong man in the affairs of the Lodge, Brother George L. Rhoads, was for three years a District Deputy Grand Master and served on many committees and was influential in the work of the Lodge in the early days. Two men, entered, passed, and raised at the same time, were vital factors in the growth of Masonry in Norwood, viz: R. W. Sumner Bagley and George H. Morse. It was said of R.W. Bro. Bagley that he could fill any office in the Lodge, Chapter, Council, or Commandery at an instant's notice and properly quote the ritual. He was nearly always present at the meetings and could prompt officers at any time. Brother Bagley rendered efficient work as an instructor and his candidates were always ready to pass an examination in open Lodge. One of his candidates said that his only failure in his examination was that he gave the plural of a word when it should have been singular and that Brother Bagley reminded him of it afterwards. No man was more interested in the work or had a better knowledge of Masonry. His son, R. W. Walter S. Bagley, followed his example and was highly esteemed in the Lodge; and his grandson, Wor. Louis C. Bagley, served Orient Lodge as Master in 1943. From 1867 to 1912 there had been but three Tylers in Orient Lodge, viz: Warren E. Rhoads, Walter D. Chickering, and Arthur L. Bateman. Brother Rhoads served from 1867 until his death in 1912, a period of forty-five years; Walter D. Chickering served from 1913 to 1923, a period of ten years; and Arthur L. Bateman served from 1923 until his death in 1938, a period of fifteen years. Much could be said about Warren E. Rhoads: he was the Chief of Police of the Town for many years, and aside from his duty as Tyler, he also furnished the supplies when the Lodge was called from labor to refreshment. Many of our members know how they looked forward to the end of the evening and wondered what Warren would have waiting for them. They were sure of one thing — it would be good. It is not often that a Tyler in these days has to exercise his duty in keeping off cowans and eavesdroppers, but that is one thing that Tyler Chickering certainly did once in the old Village Hall building. There was a commotion one meeting night just outside one of the windows, and on examination, Tyler Chickering found a young man hanging to the eavestrough looking into the lobby. The young man apparently wanted to see how it was done inside without going through the regular formalities, but Brother Chickering thought differently, for he reached through the window, pulled the young man in, and sent him down the stairway with a rather uncomfortable feeling, well, just where one might think he would have it. What can be said of the third man, Arthur L. Bateman? Not only had he filled his Tyler's position faithfully, but for twelve years, until his death August 19, 1938, personally gave the lectures to all applicants and never in all this time did a candidate appear in Orient Lodge to be examined without a mark of at least 98%. Brother Bateman was a man who never sought a high office in the Lodge, but whose whole heart and soul were bound up in the work and one who didn't let his left hand know what his right hand did. Upon the death of R. W. James A. Hartshorn, the Lodge lost a true friend to Masonry. He was invariably asked to install the officers of the Lodge and did it in a manner which not only was ritually correct, but which left an impression with the elected officers of the high quality of the work which they were to perform. Until his death, Wor. Francis E. Everett acted as his installing marshal. They were competitors in business and formed a friendship and companionship such as only an organization like ours could bring about. Recognition should be given to a Chaplain of the Lodge for a great many years, Rev. George Hill, who was always ready to help in any way and who was not only a good pastor and a good Chaplain, but who also had good business acumen and in the former days served on many committees. Perhaps the largest attended meeting ever held in Orient Lodge was when Bro. Frank G. Allen received his third degree and was raised by Judge John M. Gibbs. Bro. Allen was then President of the Massachusetts State Senate and afterwards our Governor. He was also Chairman of the Board of Directors of Winslow Bros. & Smith Company. Brother Frank A. Fales, a quiet man who accomplished much, was largely influential in the building of our present Temple, not only in his sound business ability, but in obtaining land on which to build and construct the building, so that we received the most for our money. Bro. Fales didn't say much, but he did a lot. We hold in reverence the memory of Andrew G. Morrow, Past Master, Past District Deputy Grand Master, Past High Priest, Past Grand Scribe, Past Thrice Illustrious Master, Past Commander, a lovable man not only in the confines of Orient Lodge, but throughout the whole jurisdiction. The type of men mentioned above are the foundation upon which our Orient Lodge has builded and which will be the incentive to a larger growth in the years to come. A member who took the keenest interest in Orient Lodge and has been of the greatest financial assistance of any single member was George Percy Williams, who was raised to the degree of Master Mason in Orient Lodge on May 8, 1922, at the age of 57 years. He passed away in Milton, Massachusetts, on February 12, 1934. He was a bachelor who enjoyed the company of other men and particularly appreciated the atmosphere of fellowship in the Lodge. During his younger days he had a seat on the Boston Stock Exchange. He later sold this and retired to a home on the shore of Lewis Bay in Hyannis. He enjoyed living there and wanted Orient Lodge to have this property for the benefit of its members. By the terms of his will, this property was left to Orient Lodge with a provision that it should not be sold for less than 410,000. The Lodge acquired possession of it in September of 1936. For a period of years various members and groups of members enjoyed going to Hyannis and did the work of painting, repairing, cleaning and taking care of the yard. Eventually the need for repairs became extensive. The Lodge did not have sufficient funds to take care of such repairs and also needed additional funds for maintenance of the Temple. The sale of the Hyannis property was considered, but the highest offer obtainable in the depreciated real estate market at that time was $5,000. The property was finally sold on July 1, 1957, for the stipulated $10,000. B. To the Trustees of Orient Lodge, A. F. & A. M., Norwood, Massachusetts, and their successors, five twelfths of said trust estate, but in trust nevertheless to be designated, held and managed by said trustees of Orient Lodge, in accordance with the instructions hereinafter contained and set forth, to wit: To designate this part of the trust estate which they receive as the "George Percy Williams Trust Fund." To pay annually for twenty years one-half of the income from said trust fund to the Treasurer of said Orient Lodge, A. F. & A. M., for the sole purpose of defraying the ordinary and usual expenses of said Orient Lodge, A. F. & A. M. To add one-half of the income from said trust fund to the principal thereof for twenty years, at which time to pay thereafter the entire income or any part thereof to any worthy charity, preferably to any indigent fellow member or members of said Orient Lodge, A. F. & A. M.; and whether or not any member or members be worthy and indigent shall be left entirely to the discretion of said trustees. Said trustees are hereby authorized to make any payment or payments under the next preceding clause at any time or in any manner that in their opinion may be of the greatest benefit to the beneficiary or beneficiaries. One-half of the income from the fund has been turned over to the Lodge each year for eleven years and the amount is sufficiently substantial to be helpful in defraying current expenses. This fund is designated as the George Perry Williams Fund and its present value has increased with accumulations and changes in market prices. At a meeting held on March 8, 1937, Bros. Bateman and Archibald presented a portrait of Bro. Williams to the Lodge and it was voted to set aside a regular meeting in May of each year as a memorial to him. This portrait now hangs in the smoking-room adjacent to the lodge-room, which is known as the George Percy Williams Room under a vote passed by the Lodge on May 9, 1949. For many years the Towns of Walpole and Medfield were within the jurisdiction of Orient Lodge. In 1921 Azure Lodge of Walpole was instituted and took from Orient Lodge a number of Walpole Brethren. Azure Lodge was formed with perfect harmony from Orient Lodge and regarded as a fond offspring. The Town of Westwood was not within the jurisdiction of Orient Lodge till 1946, when Orient Lodge acquired concurrent jurisdiction with Lodges of Walpole, Canton, Dedham, and Needham over Westwood. During his term as Master in 1939, Wor. F. Albert Hayes did valuable work in stabilizing the conduct of the Lodge and helping to straighten out financial difficulties. The first Ladies' Night was on November 10, 1941, and was attended by R. W. Arthur W. Coolidge, who formerly lived in Norwood and was then Deputy Grand Master and later Grand Master. Invitations were extended to widows of deceased members of Orient Lodge and this occasion has become an annual event. Under the supervision of Wor. Robert H. Steele as Master in 1945, and with the help of additional funds raised largely through the efforts of Bro. Vern H. Richards, the Temple was completely redecorated and put in first-class condition. A present member who has recently made substantial contribution to the welfare of the Lodge and whose efforts are continuing is R. W. Carl R. MacKenney. A special communication attended by the Grand Master, Most Worshipful Whitfield W. Johnson, was held in his honor in the Masonic Temple on March 15, 1956. At that time Bro. MacKenney was Senior Grand Warden of the Grand Lodge of Massachusetts, and he was presented with the Henry Price Medal for distinguished service to Masonry. There are others who deserve mention and are not referred to merely for lack of space. Following the conveyance of the Day Street property to the Lodge under a written Trust, the real estate taxes were abated for the year 1959. During the entire period of one hundred years, Orient Lodge has been remarkably free from discord or friction and there have been many instances of loyal and unselfish service to the Lodge and to fellow members. With such a background, it would seem that the future can only be bright. By Rt. Wor. Roland K. Woodberry. (For a more comprehensive history of the earlier years, see 1961 Mass. 67-77). One hundred and twenty-five seats ago, what is now the prosperous town of Norwood was a part of the town of Dedham. known as Second Parish, or South Dedham. with many farms and some manufacturing concerns. Through the years the farms gradually disappeared and many of the industries of the early days that played an extensive part in the growth of the town also ceased to exist. The firms of Winslow Brothers & Smith, the Norwood Press, and Plympton Press, three of the largest businesses of their type in the country played their parts and left the stage for others to take their place, to continue the growth of the area. It is interesting to note that in 1860, the town of Dedham, which included the areas thai are now the towns of Norwood and Westwood, appropriated the sum of $25,810.25 to cover the expenditures of the town for the year. How times have changed! On February 4. 1861. just one month before Abraham Lincoln was first inaugurated President, and eleven years before the town of Norwood was incorporated, seven Master Masons gathered in the small meeting room over Village Hall in South Dedham to talk over the feasibility of forming a Masonic Lodge. These seven men must have had a great deal of courage and a firm belief in Ihe teachings of the fraternity to undertake the responsibility of forming a Lodge. At the next meeting eight applications for the degrees were received and the fee was set at $20. Among these first petitioners were John E. Smith and Lewis Day. Brother Smith was a member of the firm of Lyman Smith & Company that later affiliated with and became Winslow Brothers & Smith, a large leather concern. Brother Day was also in the leather business and built the house at 93 Day Street now owned and operated by the Norwood Historical Society. Brother Day was one of the wealthiest men in South Dedham and represented this district in the Slate Legislature. At this second meeting it was voted to make arrangements with the Norfolk Division Sons of Temperance to occupy the large hall over Village Hall and share expenses. The record does not indicate whether the Sons of Temperance had any influence over our early Masonic brethren. The Lodge met from 1861 to 1915 in Village Hall, that stood on Washington Street at the corner of Cottage Street where the Folan Block now stands. The Lodge purchased the building in 1868 and sold it to George F. Willett in October 1915. Mr. Willett had the building moved to the corner of Broadway and Nahatan Street where it remained until destroyed by fire April 14. 1964. This building was used for a number of years as an office of the Norwood Messenger. From October 1915 to September 1917, the Lodge met in Conger Hall at the corner of Washington Street and Railroad Avenue. During this period our present Temple was designed and erected under the direction of William G. Upham, a member of the Lodge and a distinguished architect, who lived and maintained an office in Norwood for many years. The cornerstone was laid August 12. 1916 and the Temple dedicated September 27. 1917. The Building Committee was composed of Frank A. Fales as Chairman and Brothers Walter F. Tilton. Charles A. Gilmore, Frank A. Morrill, Frederick L. Fisher. Henry F. Walker. Francis E. Everett. LaForest N. Newman, Wor. Ezra L. Hubbard. Wor. Martin J. Blasenak and Rt. Wor. Andrew C. Morrow. At the meeting held on March 4, 1861, we find that one candidate whose name was proposed on February 25 was rejected, three candidates were initialed, and two more candidates were proposed. Two days later on March 6. 1861. one of the candidates proposed at the March 4th meeting was elected and two of those elected on February 25th were initiated. At the February 25th meeting the following officers were appointed: Treasurer. Joseph Day; Secretary, Henry C. Morse; Senior Deacon. Eben M. Gay: Junior Deacon. C.E. Davidson; Steward. J.S. Woodman: and Tyler. Joseph Summer. Thus began the early days of Orient Lodge which for these 125 years has prospered, and although there have been times in its history when the prospects were anything but bright, through strong leadership and good business management the Lodge has been of service to the community. On March 18. 1862. the Masonic Hall was dedicated and consecrated by the Grand Master, M.W. William D. Coolidge. Orient Lodge was now recognized by the Grand Lodge as a subordinate Lodge, having full power to work and transact such business as may regularly come before it. At the Quarterly Communication ol the Grand Lodge on March 12. 1862. the granting of a charter for the Lodge was approved with an effective date of February 22. 1861. Prior to the abolition of jurisdictional lines by the Grand Lodge, the towns of Walpole. Medfield, and Westwood were within the jurisdiction of Orient Lodge. So in 1921 when Azure Lodge of Walpole was instituted it took from Orient Lodge a number of our Brethren. Azure Lodge was formed with perfect harmony from Orient Lodge, and we look upon Azure Lodge as u fond offspring and rejoice in as activities through the years. At the time their quarters were destroyed by fire in 1934, we were glad to have them use our Temple until their new quarters were completed. As we look back through the records we find many brethren who contributed their time, talents, and financial resources to make the splendid history of Orient Lodge possible. Perhaps the outstanding man during the formative years was Joseph Day. who held the position of Treasurer from the beginning of the Lodge in 1861 until his death in 1876. He was a man who did not come into the limelight as much as some others; nevertheless, with his advice and counsel he was a strong influence in the affairs of the Lodge. Rt Wor. George L. Rhoads served on many committees affecting the work of the Lodge in the early days and was the District Deputy Grand Master of the district for three years, 1874-1876. Rt. Wor. Charles W. King also gave many years of service to the Craft. He was Secretary for two years. 1877-1878. before becoming a line officer. Following his two terms as Master in 1886. he was appointed District Deputy Grand Master for the years 1887-1888. In recognition of his outstanding Masonic service he was presented the Henry Price Medal in 1922. Two men. entered, passed, and raised at the same time, who were vital factors in the growth of Masonry in Norwood, were Wor. Sumner Bagley and George H. Morse. It was said of Brother Bagley that he could fill any office in the Lodge, Chapter, Council, or Commandery at a moment's notice and properly quote the ritual. He rendered efficient work as an instructor and his candidates were always prepared to pass an examination in open Lodge. No man was ever more interested in the work or had a better knowledge of Masonry. It was gratifying to have his son Rt. Wor. Walter S. Bagley follow in his footsteps as an outstanding leader in our district, and his grandson, Wor. Louis C. Bagley also served the Lodge as Master in 1943. Brother George H. Morse, who received the degrees with Wor. Sumner Bagley, bequeathed to the Lodge a sum of money that helped maintain the financial stability of the Lodge. Another principal benefactor of the Lodge was Bro. George Percy Williams, who was raised a Master Mason on May 8. 1922 by Rt. Wor. James A. Hartshorn, who according to the records was one of our most distinguished and proficient ritualists Brother Hartshorn served three terms as Master of the Lodge from 1892 to 1894. became District Deputy Grand Master of our District, and was a charter member and the first Master of Azure Lodge in Walpole. There were four other candidates that took the degrees along with Brother Williams - namely. Curtis Lord Boulter. Victor Frederick Johnson. Earl Holden Winslow, and Edwin Curry Archibald. Treasurer of the Lodge from 1928 to 1968. Brother Winslow. who now resides in Schenectady, New York, is the last surviving member of the class. A close Masonic friend of Brother Williams was Arthur L. Bateman. Ty| the Lodge for 15 years and who for a long lime instructed the candidates on their degree lectures. Brother Bateman. together with Brother Archibald presented to the Lodge ai the regular meeting held on March 8. 1937 the picture of Brother Williams that hangs in the anteroom. It was at this time (1937) that the Lodge voted to set aside a meeting in May each year as a Memorial to Brother Williams. At the regular meeting of May 9, 1949 the Lodge voted to designate the anteroom as "The George Percy Williams Room." Brother Williams in his younger days was a member of the Boston Stock Exchange. He retired to a beautiful spot at Hyannis Park on Lewis Bay in the town of Yarmouth. The real estate, consisting of a ten room house, garage, and five additional lots of land were bequeathed to the Lodge with the stipulation that the entire property could not be sold for less than $10,000. The Trustees of the Lodge obtained title to the property on September 23, 1936. It was Brother Williams' wish for the Lodge to have this property for the benefit of the members. For a number of years, various members and groups enjoyed (he use of the property and saw to it that it was properly maintained. Eventually, the need for repairs became extensive and it was decided to dispose of it. The real estate market at the time was greatly depressed: however, the entire property was sold to one William A. Nicol of Westwood for the stipulated sum of S1O.OO0. The property would easily bring a substantial fortune today. Brother Williams also left five twelfths of his estate to the Lodge, which was payable after the death of a life beneficiary. Some time was required to settle the estate and during the spring of 1949 there was turned over to the Trustees the sum of $57,262.80. In accordance with the instructions contained in the will, the amount received was designated the "George Percy Williams Trust Fund." What kind of man was George Percy Williams? We learn from those who knew him that he was. vitally interested in Masonry. That he lived up to the principles and tenets of the order and was greatly inspired by the teachings and its high ideals. He most certainly must have thought a great deal of Orient Lodge, otherwise he would not have remembered us so generously in his will. It seems that a man of this type would not want us to overlook the fact that others, perhaps not as financially well-to-do. have also been generous in their bequests to the Lodge. So, we pause for a few moments to remember our other benefactors: George H. Morse. Perley V. Evans. William H. Griffith. Frank A. Morrill, Frank W. Talbot. Harrison S. Holton. William R.D. Mills, Carl W, Hanf and Arthur R. Girling. It is to a large extent, through their thought fulness, that the Lodge has been able to maintain the Temple and discharge its charitable obligations. No finer tribute to these brothers could be said than to quote the inscription that appears on the memorial plaque that hangs over (he Tyler's desk - "Dedicated to 'he memory of our late brethren and benefactors 'until lime shall be no more.'" A difficult period for the Lodge was the early I930's. when the number of applicants decreased significantly and for the first time many suspensions for nonpayment of dues occurred. At this same time the Lodge suffered the loss of three leaders within a span of two years. The Worshipful Master. George T. Hartshorn, died on February 24. 1932 (the only Master to die in office) followed by the Secretary. Brother Waller Blair, who died October 24. 1932. and his successor as Secretary, Rt. Wor. Andrew C. Morrow, who died July 10. 1934. The Senior Warden. Ernest May. became Acting Master upon the death of the Master and after completing Wor. Brother Hartshorn's term. Brother May served two additional terms as Master, providing the strong leadership so necessary at that time to keep the Lodge from falling into disarray. Brother May had the honor of raising his son. Winslow P. May. on January 8. 1934; and ten years later, on September 13. 1943. while serving as District Deputy Grand Master, he installed him as Muster of the Lodge. Rt. Wor. Ernest May devoted many years of service lo Masonry in general and Orient Lodge in particular. Wor. Brother Winslow F. May followed in his lather's footsteps with his interest in the Lodge. He became an officer in 1935. and held office continuously for 41 years. He was Secretary of the Lodge for 21 years, retiring from that post on September 18. 1976. He loo was honored by the Grand Lodge by being appointed District Deputy Grand Master for the years 1963-64. It was also his privilege to raise his son, Russell W. May. on December 12. 1955 and eight years later on September 21. 1963. while serving as District Deputy, lo install him as Master of the Lodge. Over 250 friends and associates were present at a testimonial dinner dance held June 18. 1976. at Mosely's on the Charles in Dedham in recognition of Rt. Wor. Winslow F. May's many years of distinguished service to the Craft. He best can be remembered by the words of tribute offered thai evening by the Master of Ceremonies as "a delightful character, one who was always willing to lend a sympathetic ear, a helping hand, a friendly smile, and to spread the ideals of brotherhood." Wor. Russell W. May succeeded his lather as Secretary and is now in his tenth year of service in this position. He too has devoted many years of service to the Craft, as an officer of the Lodge, as an officer and Past Master of the Lodge of Instruction, and two years as District Deputy Grand Secretary. Another member of this distinguished Masonic family is Rt. Wor. Raymond C. Berry, who joined ihe Lodge in the fall of 1948. progressed through the line offices, and became Master in September 1953, He was honored by the Grand Lodge by being the recipient of the Joseph Warren Medal for Distinguished Service in 1973 and appointment as District Deputy Grand Master for the years 1977-78. Ri. Wor. Brother Berry has served the Lodge as Trustee and Clerk of the Board since 1966. He is also the District Representative to the Masonic Home. Henry C. Morse, the first Secretary; Edgar L. Bigelow, whose service spanned 17 years; George W. Cushing, 1896-1910; Edgar W. Metcalf. 1910-1920; Walter Blair. 1921-1932; Albin K. Parker. 1934-1953; Winslow F. May, 1955-1976; and Russell W. May, 1976 to date. Our ten Treasurers did much to bring financial stability to the Lodge: Joseph Day, 1861-1876: George H. Morrill, 1877-1894; Edmund J. Shaituck. 1895-1903; Edgar L. Bigelow, 1903-1911; Andrew C. Morrow. 1911-1915; Edmund U. Mason, 1915-1916; Henry W. Caldwell. 1916-1927; Robert S. Baker. 1927-1928; Edwin C. Archibald. 1928-1968: and Roland K. Woodberry, 1968 to date. We also remember other officers who served for many years: our Chaplains Rev. George Hill, from 1867 to 1897; Rev, Arthur H. Pingree. who drowned attempting to save the life of a parishioner July 19, 1915; the Rev. Charles H. Brown, for many years rector of the Episcopal Church: Rev. William F. English, 1942-54; Rev. Leland L. Maxfield. 1955-77: and Wor. Russell S. Finbow. since 1979. We recall Warren E. Rhoades, Chief of Police and Tyler for 45 years: Walter D. Chickering. Arthur L. Bateman. Eben W. Dean, and Harry A. Shannon, all long time Tylers. Some served as organist for many years: Frank D. Draper from 1874 to 1919; Carl L. Smith, beginning in 1921 continuing with interrupted service through 1949; and our current organist. Stanley L. Sprague, beginning in 1954 with a five year sabbatical leave in the 1970's. There were many others who gave freely of their time - Newell W. Tibbetts in various capacities, his son, Robert W. Tibbetts as Electrician; most of our Trustees saw many years of service on the Board. George H. Morse. Edmund J. Shattuck. William S. Gay. H. Frank Walker. LaForest N. Newman, Frank A. Fales, Robert I. Barr. R. Russell Williamson. Walter F. Tilton. and Ernest May to name but a few. Perhaps the Trustee who did more to enhance the financial well-being of the Lodge in recent years was Herbert L. Barrett who served on the Board from 1941 through 1962. He did much work to obtain the tax-exempt status for our Temple and with Trustee Herbert E. Tucker, prudently set up the George Percy Williams Trust Fund investments. In recognition of his outstanding service to the Lodge. Brother Barrett was presented the Joseph Warren Medal for Distinguished Service at the 100th Anniversary Celebration (1961 Mass. 65-77), May 6. 1961. by the Grand Master. Most Worshipful Laurence E. Eaton. Brother Henry P. McLaren was elected to [he Board of Trustees in 1962 and succeeded Brother Barrett as Chairman. With his sound legal advice and wise investment counsel, the Lodge continues to prosper. We are indeed indebted to all our Trustees for their devoted service. "Friday afternoon, July 13. 1934. "Lodge opened at 1:55 p.m. with 95 members and officers present. The Lodge was called from labor to refreshment and formed in procession and marched lo the First Congregational Church where Masonic services were conducted by the officers of the Lodge for Rt. Wor. Andrew Carson Morrow. Rev. and Brothers William F. English. Pastor, and Robert Wood Coe. former Pastor, also participated in the service. The Lodge reformed at the conclusion of the service and marched to the Temple. "Lodge closed at 3.45 p.m. In the summer of 1927 Carl Russell MacKenney petitioned the Lodge and was elected to receive the degrees on September 12th. Thus began a Masonic career (hat has spanned nearly 60 years. Brother MacKenney was installed Marshal on September 13. 1943 and the next year began the line as Senior Steward. He diligently attended to his duties, tilling each subsequent position with dignity and efficiency. On September 12. 1949 he was installed the 51st Master of the Lodge. His was a busy year in the East, as the record shows he processed 31 applications for the degrees. A good deal of time was allocated for social activities. The Annual Ladies' Night was held November 5. 1949 and was well attended. This was also the era when the "3-5-7 Club" was at its zenith. with suppers, entertainment, and dances held on a regular basis Brothers Richard P. Pennington. John Pratt. James W. Garner, and Joseph E. Traylor, to mention but a few. did much to keep this "Club" going, providing the members with excellent evenings of enjoyment. Brother MacKenney instituted the children's Christmas party that has continued through the years as an annual event. His term as Master, and his leadership abilities, were so outstanding that three months after retiring as Master, he was appointed District Deputy Grand Master by Most Worshipful Thomas S. Roy for the years 1951 and 1952. Once again. Brother MacKenney's talents were put to good use, for the benefit of Masonry in our district. The Lodge was overjoyed on December 14. 1955 when Brother MacKenney was elected to the office of Senior Grand Warden, the only member of the Lodge to be so honored. A reception was held at the Lodge on Thursday, March 15, 1956 with the Grand Lodge Officers and many guests in attendance. At this meeting the Grand Master. Most Worshipful Whitfield W. Johnson, presented Brother MacKenney with the coveted Henry Price Medal. He was subsequently appointed Grand Representative for the Grand Lodge of Germany near our Grand Lodge. Wor. Brother Karl A. Johnson was also honored at this time for his appointment as Grand Pursuivant of the Grand Lodge. Over the years, Brother MacKenney has been active in the degree portrayals in the Scottish rile. Valley of Boston; an officer in the York Rite Bodies. Commander of Boston Commandery No. 12. K.T. : Potentate of Aleppo Temple. A.A.O.N.M.S. ; and for many years has been our Representative to the Masonic Home. During all these years, Orient Lodge always came first with Brother MacKenney and he gave unstintingly of his lime and efforts as an officer. Trustee. Ritual Master, and Installing Officer, to do all that he could to uphold the prestige and honor of Freemasonry. If a job needed to be done. Brother MacKenney could be counted on to do it. and do it well. His advice and good counsel is still very much appreciated. On December 28. 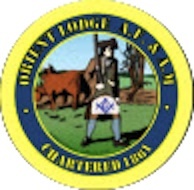 1970. the Lodge was again honored with the appointment of Rt. Wor.James M. McBride as District Deputy Grand Master. Brother McBride was an exceptionally talented officer in the Lodge, and in the 37th Lodge of Instruction, which prepared him well for his duties as District Deputy. His capabilities continued to be noticed by the Grand Master and on December 27, 1972 he was installed Junior Grand Deacon. The following year, on December 27. 1973. he was installed as Deputy Grand Master of Masons in Massachusetts. During the year 1974, the Masonic Home Expansion Program was instigated and Brother McBride was named General Chairman, to raise the funds for this project. This entailed numerous meetings, organizing groups, and speaking at many Lodges throughout the jurisdiction. No stone was left unturned in his efforts to make the campaign a success, It was a source of great pride for him. that Orient Lodge and its members responded so generously to his call and contributed over $50,000. The fund drive was so successful, raising more than the goal that had been set. This allowed the new wing at the Masonic Home to be built and so enhanced the facilities for the care and comfort of the guests under our care. A reception was held at the Lodge on Saturday, February 2, 1974 to honor Brother McBride for his appointment as Deputy Grand Master. Despite the fact that it snowed most of the day. a large attendance was on hand to welcome the Grand Master. Most Worshipful Donald W. Vose and the other Grand Lodge Officers and guests. At this meeting, the Lodge Treasurer, Roland K. Woodberry was pleased to present Brother McBride with his Deputy Grand Master's jewel and the Grand Master presented him with the Henry Price Medal. Later in the year. Brother McBride was appointed Grand Representative for the Grand Lodge of Georgia near our Grand Lodge. Still active in many Masonic circles. Brother McBride is ever ready to offer a helping hand. Another Past Master who has given much time in the service of the Craft is Rt. Wor. Roland K. Woodberry. He was appointed District Deputy Grand Secretary in 1963 and again in 1971. Most Worshipful A. Neill Osgood appointed him a member of the Grand Lodge Education Committee in 1964 where he continues to serve and in 1973, he was named Clerk of the Committee. Brother Woodberry was appointed Junior Grand Steward for the year 1973 and Grand Standard Bearer for 1974. 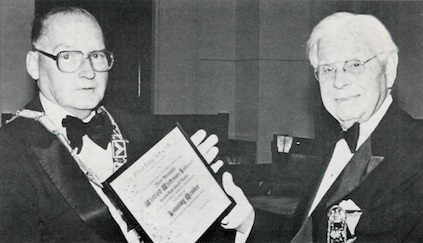 He served as Vice Chairman of the Masonic Home Expansion Program and was honored by Most Worshipful J. Philip Berquist with the presentation of the Joseph Warren Medal at the 37th Lodge of Instruction on April 30, 1982. Most Worshipful Brother Berquist again honored Brother Woodberry by appointing him District Deputy Grand Master for the year 1983 and by selecting him to be the Grand Representative to the Grand Lodge of Mexico (El Potosi) near our Grand Lodge. Most Worshipful David B. Richardson reappointed Brother Woodberry District Deputy for the year 1984. Brother Woodberry was first appointed an officer of the Lodge in 1957 and has served continuously ever since, currently holding the position of Treasurer. One of the highlights of his service as District Deputy was the opportunity on November 14. 1983 of presenting Wor. Russell S. Finbow with the Joseph Warren Medal for Distinguished Service. This award was bestowed on Brother Finbow in recognition of his many years of service to the Lodge, to his family, to his Church, and to the Town of Norwood. Brother Finbow was District Deputy Grand Marshal for six years and has been Chaplain of the Lodge since 1979. Orient Lodge could always be proud of its members who did what they could to reflect honor upon the fraternity and carry out in their daily lives the teachings of Freemasonry. No doubt our member who attained the greatest prominence in public life was Frank Oilman Allen. A member of the Board of Selectmen of Norwood for many years, he was President of the Massachusetts State Senate when he was raised a Master Mason by Judge John M. Gibbs. June 23, 1920. This was perhaps the most well-attended meeting ever held in Orient Lodge. Brother Allen was Chairman of the Board of Winslow Brothers & Smith and served as Governor of the Commonwealth in 1929 and 1930. He was honored by the Supreme Council for the Northern Masonic Jurisdiction by being created a 33rd Degree Mason at Boston. Massachusetts on September 16. 1930, the only member of the Lodge to be so honored. From time to time the Grand Lodge has participated with Orient Lodge in ceremonies worth noting. One such occasion was the laying of the cornerstone of the Universalist Church (now the United Church of Norwood) on Monday, September 21. 1885. This service was conducted by Rt. Wor. Frederick D. Ely, Deputy Grand Master, assisted by other Grand Lodge Officers. Brother Ely was a resident of Dedham, and at the time was a member of Congress, representing our district. A proud moment in the history of Orient Lodge was the laying of the cornerstone of our Temple at 76 Day Street, Norwood, on Saturday, August 12, 1916 (1916 Mass. 282-292). By special warrant. Rt. Wor. Frederick W. Hamilton. Grand Secretary, was appointed to conduct the ceremony. A list of the objects placed in the box under the cornerstone may be found starting on page 284 of the 1916 Proceedings of the Grand Lodge. Brother Ralph Emerson Bullard, a member of Orient Lodge, was chosen orator of the day and delivered a very inspiring address. On September 27, 1917. a Special Communication of Grand Lodge was held for the purpose of dedicating the new Masonic Temple in Norwood (1917 Mass. 249-257). After the ritual of dedication had been concluded, the Grand Master, Most Worshipful Leon M. Abbott, and our own Rt Wor. James A. Hartshorn each addressed the Lodge in eloquent and inspiring words. It was at this meeting that the Grand Master presented to the Lodge in eloquent and inspiring words the Bible that now rests upon our Altar. The Grand Lodge again joined with us on Monday, April 13, 1936, for the purpose of observing the 75th Anniversary of the Lodge (1936 Mass. 56-67). The Presiding Master. Wor. Frederick H. Bagley, welcomed the Grand Master who assumed the East and conducted the exercises of the evening. The Charter was read by Wor. Elmer E. Clapp. Senior Past Master of the Lodge, and Wor. Albin K. Parker read the Lodge history. The Grand Master made a most inspiring address, dealing with the splendid work done by the District Deputy Grand Masters, the Masters, the Service Representatives, and the Brethren, in relieving distress and dealing generally with the conditions caused by the disastrous floods of mid-March. In the fall of 1947, the Town of Norwood held several events observing the 75th Anniversary of the incorporation of the Town. State Representative Charles F. Holman, a member of Orient Lodge, was the Chairman of the Executive Committee that planned these events. The celebration concluded on Saturday. November 1st. with a long and colorful parade through the center of Norwood, past the Reviewing Stand at the Common. Many members of Orient Lodge marched as a unit and were joined by Temple Commandery. Hebron Royal Arch Chapter, and King Arthur Chapter, Order of DeMolay. With the units from Aleppo Temple. A.A.O.N.M.S.. also participating, the Masonic group was the largest contingent in the parade. Leading us on this occasion in full Masonic regalia was the Grand Master, Most Worshipful Samuel H. Wragg, who was also the Sheriff of Norfolk County. The principal speakers of the day were the Chairman of the Board of Selectmen. H. William Anderson, a member of Orient Lodge, and the Lieutenant Governor. Arthur W. Coolidge. Many will recall that Brother Coolidge was the son-in-law of our member Walter F. Tilton. and at that time the junior Past Grand Master of our Grand Lodge. The Norwood Messenger stated that 5,000 marched in this parade, and 25.000 spectators gathered in the square for the Commemorative Exercises at the Reviewing Stand. By special dispensation of the Grand Master, the 100th Anniversary of the Lodge WU held at the Westwood High School on Saturday. May 6. 1961. with over 400 members of the Lodge in attendance. Wor. James M. McBride. the Presiding Master, welcomed the Grand Lodge Officers, after which the Grand Master. Most Worshipful Laurence E. Eaton, conducted the exercises of the evening. A comprehensive history of the Lodge, compiled by Herbert L. Barrett and Edwin C. Archibald, was read by Wor. Eugene A. Nelson. The Grand Master, and several of the other Grand Lodge Officers addressed the Brethren. A quartet provided appropriate musical selections. A social night to commemorate the 100th Anniversary was held on Friday evening. May 19. 1961. at the Blue Hill Country Club in Canton, with over 400 members, ladies, and friends in attendance. In 1958, Orient Lodge extended the hand of friendship to Lafayette Lodge, inviting the Lodge to move to Norwood and meet in our Temple. During these past 28 years our relationships have been most cordial and harmonious. So in 1985 when Dover Lodge merged with Lafayette, we in Orient Lodge were pleased to also welcome them into our Masonic family. Hyde Park Lodge suffered a disastrous fire in 1982 and again Orient Lodge extended a welcome for the Lodge to meet in our Temple until other arrangements could be worked out. As a result of this fire. Hyde Park Council of Royal and Select Masters did relocate in our Temple and we are happy to have the Council share our facilities. Samoset Chapter No. 109. Order of the Eastern Star, Hebron Chapter. R.A.M., and Temple Commandery No. 48. K.T., have been a pari of our family for many years and moved into this Temple upon its completion in 1917. Orient Lodge is grateful and very appreciative of their interest and support for all these years. In 1984 it became necessary for Norwood Assembly No. 8, Order of the Rainbow for Girls, and King Arthur Chapter, Order of DeMolay, to surrender their charters. Orient Lodge was saddened by their passing from the scene, as each organization had provided the inspiration of fraternal ism among the youth of Norwood and the surrounding towns for more than half a century, The first Ladies' Night was held at the Temple on Monday, November 10. 1941. with dinner and entertainment, for a cost of $2.50 per couple! Invitations were extended to the widows of our deceased members and this custom has been carried on ever since. Rt. Wor. Arthur W. Coolidge, then the Deputy Grand Master, was the guest of honor that evening. The Ladies' Night programs continued to be held at the Temple until 1967. when Wor. John L. Wentzell decided that more members and friends could be accommodated if the event were held at a larger facility. Thus, on Saturday. November 4th. the first Ladies' Night outside the Temple was held at Amaru's Restaurant in Dedham. It was a delightful evening, with dinner, entertainment and dancing to the music of Paul Monaghan's orchestra. The largest attended Ladies' Night was held on Friday evening, November 21, 1969, at the King Philip Ballroom in Wrentham. when approximately 460 joined the Worshipful Master, George N. Johnston, in a wonderful social evening of dinner, dancing and entertainment. From time to time, the Lodge has held other programs such as the Social Nights at Moseley's on the Charles in Dedham. and at the Ponkapoag Civic Association in Canton. The Family Nights, held regularly for the past 20 years at the Temple. have brought together many who otherwise might not have had the opportunity to enjoy our Masonic fellowship. These activities all added much to the vitality of Orient Lodge. On February 15. 1969. a significant event took place. The first Masonic Knights of Columbus Dinner Dance was held at the Council Hall. This program was brought about by the leadership of Clifford F. Pearl, then the Grand Knight of Norwood Council No. 252 and Richard A. Wong, then the Master of Orient Lodge. It was a successful evening and similar events were held for several years. It was refreshing thai with turmoil and ill-will existing in so many places that the teachings of both organizations, brotherhood and friendship, could be exemplified in such a practical way. Another happy occasion took place on Sunday afternoon, October 6, 1985 at Concannon's Village in Norwood when over 300 friends, relatives, and fellow Masons gathered lo honor Brother Henry Arthur Holman and to celebrate his 90th birthday. Brother Holman was raised a Master Mason in Orient Lodge on June 21, 1920, and is the senior member of the Lodge. He was the head chef for Holman Caterers for many years until the firm liquidated in I960. At that time he joined his son-in-law. Wor. Russell S. Finbow, in operating the refreshment concession at Ponkapoag Golf Course where he enjoyed working for another 22 years. We wish Brother Holman continued good health and happiness. "The Speculative Masonry which we practice today teaches great principles, the highest ideals of character, and the practice of integrity. These were the factors in the lives of our founders. They are the foundations upon which we must build in the future. We must all carry out in our daily lives the great lessons we are taught within the Lodge. "There never was a lime in the history of our country when men of moral upright character were more needed than right now, in all affairs of life, and we. as Master Masons, should practice what we know to be the true moral virtues that our growth may be strong and secure." This new Lodge having been working the usual time under a Dispensation at South Dedham, was duly constituted and its officers were publicly installed by the M. W. Grand Master, on Tuesday the 18th ult. The new Hall, which is well fitted up, and with its adjoining apartments, is in all respects well adapted to the purposes for which it is required, was Dedicated in the afternoon, at which time the Lodge was constituted. In the evening the installation took place, in the presence of the ladies of the Brethren, and as many other visitors as the room would accommodate. The ceremonies were impressively performed and oil present seemed to be interested in them. An excellent collation was generously provided by the ladies, thus evincing their respect for the Institution. Our hope is that they may never find occasion to think otherwise than favorably of it, or any of its members. J. E. Everett, W. M.
W. H. Gay, S. W.
H. R. Jenks, J. W.
J. A. Rhoads, S. D.
A. M. Shapleigh, J. D.
G. H. Morse, S. S.
The installation ceremonies were conducted by W. P. M. John L. Stevenson, of Mount Lebanon Lodge, Boston. After the installation, the members of the Lodge and a goodly number of visiting brethren partook of a bountiful collation. W. H. Gay, W. M.
H. R. Jenks, S. W.
G. L. Rhoads, J. W.
The new Masonic Hall built for the Orient Lodge, of Norwood, was dedicated last evening, February 15, by the officers of the Grand Lodge, with appropriate exercises. Village Hall Block, which is owned by the Masons, is one of the largest and finest buildings in the village, and is situated on the principal street, but a short distance from the depot, and in the centre of the town. The hall was completed several months since, but the dedication was postponed that it might take place in connection with the annual installation of the officers of the Lodge. It is an elegant room, about forty by sixty, richly furnished, and fitted with every convenience for the comfort of members. The walls are finely frescoed and adorned with Masonic emblems. The building is complete in all its appointments, and is an ornament of which the Masons and the whole town may well be proud. W. M., Lewis Smith, Jr.; S. W., Walter C. Shapleigh; J. W., Porter S. Boyden; Secretary, Charles W. King; Treasurer, George H. Morrill; Marshal, Charles P. Dexter; Chaplain, Rev. George Hill; S. D., Albert G. Webb; J. D., E. W. Hartshorn; S. S., George E. Stewart; J. S., John Dean; Sentinel, William H. Lawler; Tyler, Warren E. Rhodes. The Grand Lodge then retired, and congratulatory speeches were made by Past Master Atwood, of Cambridge, Addison Boyden, of Boston, Grand Master Welch, A. B. Wentworth, of Dedham, and several others. The music furnished by the Temple Quartette, of Boston, was very creditable, and was heartily appreciated. Shortly after eight o'clock the company adjourned to Village Hall, in the same block, where a substantial banquet had been spread, to which the guests did ample justice. Fully two hundred and fifty were present at the tables, and, after the repast, toasts were indulged in, and the time was pleasantly passed till a late hour. Orient Lodge of Norwood, Massachusetts held its 500th regular communication Tuesday. September 15th. It was an occasion oi more than common interest. Worshipful James A. Rhoads, the oldest living past master of the lodge, was present and at the invitation of Worshipful Master Walter S. Bagley, occupied the chair during some of the ceremonies of the evening. Past Master Rhoads is nearly 85 years old but bears the years lightly. He is now a resident of Wisconsin. An interesting feature of the evening was the presentation of a Tyler's jewel to Brother Warren E. Rhoads who has served Orient Lodge as tyler for a period of 42 years. Brother Frank D. Draper, who has been Organist of Orient Lodge 36 years, presided at the organ. After the ceremonies a collation and social hour was enjoyed. The corner-stone of a new Masonic Temple to be erected at Norwood, Mass., was laid with Masonic ceremony, Saturday, August 12th. Orient Lodge was opened at 2 o'clock with a large attendance of members. A procession was immediately formed for the purpose of escorting the Grand Lodge, which had been opened in another hall, to the site of the New Temple. Owing to the absence of Grand Master Melvin Maynard Johnson, the Right Worshipful Frederick W. Hamilton, D. D., LL. D., past Deputy Grand Master and present Grand Secretary of the Grand Lodge, conducted the ceremony of laying the corner stone. He was assisted by the following officers of the grand lodge: D. Edward Miller, Senior Grand Warden; Roscoe E. Learned, Junior Grand Warden; Charles H. Ramsay, Grand Treasurer; W. H. H. Soule, acting Grand Secretary; William H. L. Odell, acting Deputy Grand Master; Rev. Francis L. Beale, acting Grand Chaplain; John F. Carver, District Deputy Grand Master of District 25; Harry P. Ballard, as Grand Marshal; Charles H. Marble and T. L. Kelley as Grand Deacons; Edmund S. Young as Grand Steward, and George W. Chester, Grand Tyler. Among the brethren in the procession were many members of Holton R. A. Chapter and Past Deputy Grand High Priest Henry S. Bunton of Hyde Park. The exercises included addresses by acting Grand Master Hamilton and Wor. Ralph E. Bullard. At the conclusion of the ceremonies a banquet was served in Conger Hall, followed by addresses by Rev. Frederick W. Hamilton, Rev. Brother Bush, Past Deputy Grand Master W. H. L. Odell, and Rev. Francis L. Beals. The new Masonic Temple at Norwood, Mass., was dedicated Sept. 27 by Leon M. Abbott, Grand Master of Masons in Massachusetts, assisted by officers of the Grand Lodge. Only members of Orient Lodge, by whom the Temple was built, and' guests were present. A banquet was served. The Grand Lodge officers were welcomed by W. M. Martin J. Blasenak. Addresses were made bv Grand Master Abbott and Right Worshipful James A. Hartshorn, of Norwood. The new Temple is on Day St., in the center of the town. It is of brick, Indiana limestone and granite, and is Greek Ionic in design. Orient Lodge recognized the long service to the Craft by M. W. Whitfield Whittemore Johnson (r.) at the 125th anniversary held in Norwood on May 12. Wor. Robert E. Perkins. Master, presented him an Honorary Membership certificate. Grand Master David B. Richardson, other Grand Lodge officers, and Masons from across the state gathered at the Masonic Temple in Norwood on May 12 to help celebrate the 125th anniversary of Orient Lodge. The festivities included a dinner and meeting during which R. W. James M. McBride, Past Master, presented a brief history and M. W. Whitfield W. Johnson was presented with Honorary Membership. Orient Lodge members, families, and friends concluded the anniversary at the United Church of Norwood on May 18, when Rev. Bro. Leon S. Hatch, Jr., preached the sermon. He had been Associate Chaplain when the Lodge observed its 100th year and is now serving a pastorate in Belmont. Presiding Master Robert E. Perkins, R. W. Ronald F. Spicer, D. D. G. M. of the Hyde Park 25th, and several Orient Lodge members took part in the service. A condensed history of the Lodge's 125 years was written by R. W. Roland K. Woodberry, Treasurer and Historian. The booklet included a list of every member of the Lodge from Feb. 22, 1861, through Feb. 22, 1986. The excellent compilation included all Officers, Trustees, and photostatic copies of Lodge notices of 1861 and 1986. When Orient Lodge began in 1861 it was chartered in what was then Second Parish or South Dedham, part of the Town of Dedham and, like most Masonic Lodges of that day, it met in many buildings in various sections of Dedham and Norwood. The cornerstone of the present temple on Day St., Norwood, was laid by R. W. Frederick W. Hamilton in 1916 and was dedicated a year later by M. W. Leon M. Abbott. This page was last modified on 28 January 2019, at 10:07. This page has been accessed 25,795 times.